Pesto is one of the best sauces in the world. It’s made from few, simple ingredients yet is so powerful in flavour and can make anything taste good, or so I think so. 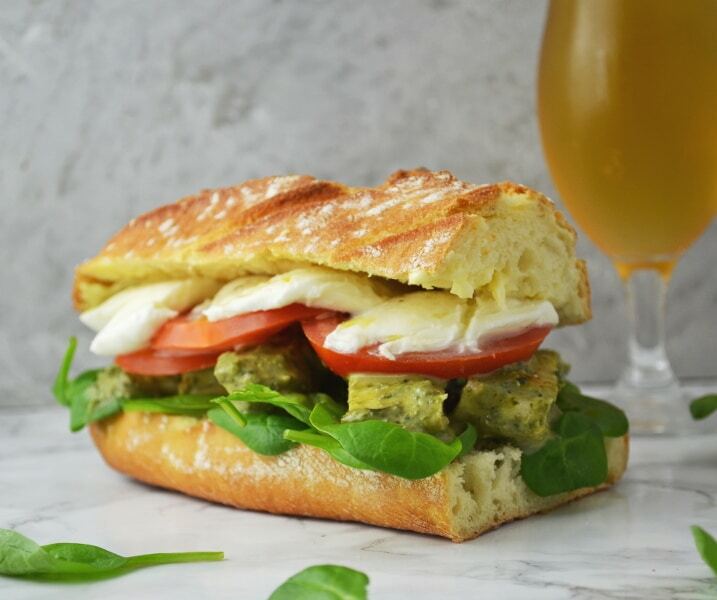 For this chicken pesto ciabatta recipe I added a heaped tablespoon of sour cream which gives it such a delicious, creamy and tangy flavour that works beautifully with the juicy strips of chicken. 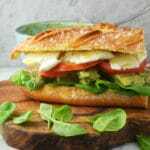 This is one of my favourite ciabatta sandwich recipes that I make quite frequently and it’s just as delicious every time! 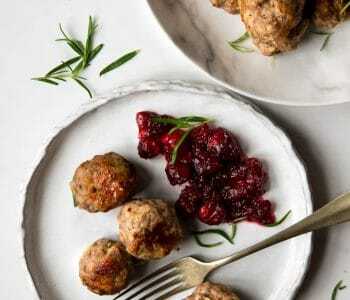 It’s one of those meals that you can have as a lunch (a very filling lunch) or dinner or even take on a picnic and you’re always satisfied. It’s so simple and easy to put together with very few ingredients just all good quality and packed full of flavour. 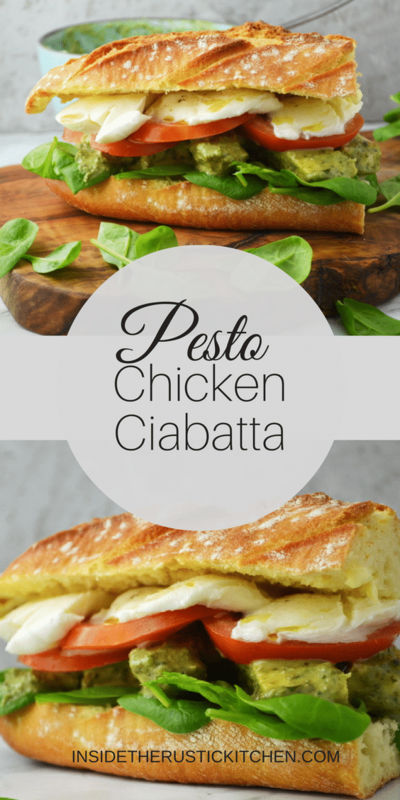 Now how do we make this chicken pesto ciabatta sandwih? Well, I’ll tell you…. I start by frying (you can also grill it) the chicken in very little oil until it’s browned, juicy and cooked all the way through, then it’s set aside to rest. I place the ciabatta in a pre-heated oven to warm up for a couple minutes whilst making the yummy green pesto. HAVE YOU TRIED MY AUBERGINE BRUSCHETTA WITH CHILI AND FENNEL? To make the pesto it’s very simple, I add basil, garlic, pine nuts, parmesan, olive oil and a squeeze of lemon juice to a bowl and blitz it together with a hand held blender until it’s formed a paste. I then add the sour cream, salt and pepper and mix it all together until it’s smooth and delicious. Now it’s time to assemble this thing of beauty. 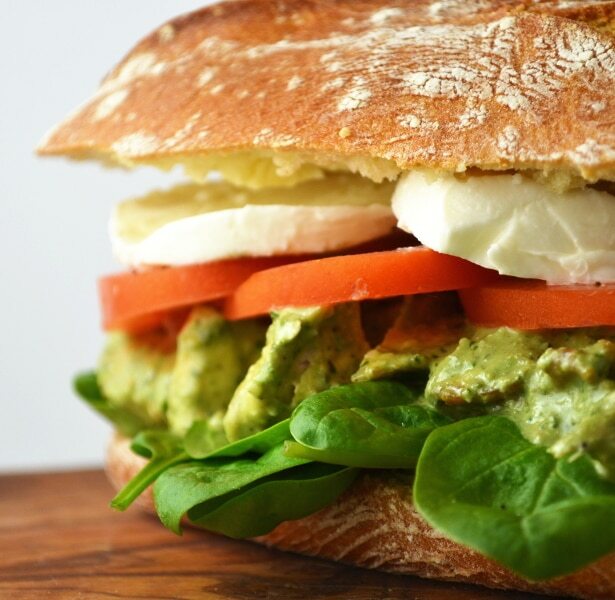 The ciabatta is cut in half, layered with a bed of fresh baby spinach then topped with the chicken and pesto. I then make a layer of juicy red tomatoes and good quality mozzarella before spreading a thin layer of mayo on the top side of the ciabatta. Dee-licious! 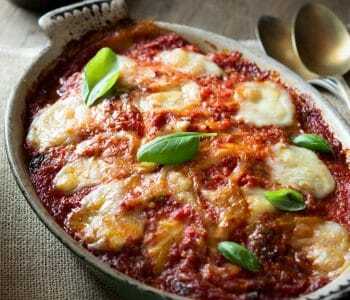 Remember if you make any of my recipes be sure to let me know how you got on in the comments below. In the next few weeks I’ll be working on a new FREE E-cookbook that I’m hoping will be available very soon. *Edit – ebook is available on the homepage. Mmm!! Love pesto! This looks amazing! I’ll have this for lunch, please! I just want to dive into that sandwich! I love the idea of adding sour cream to your pesto here. It must give the chicken a nice tang. Beautiful! Wow, that looks so filling! 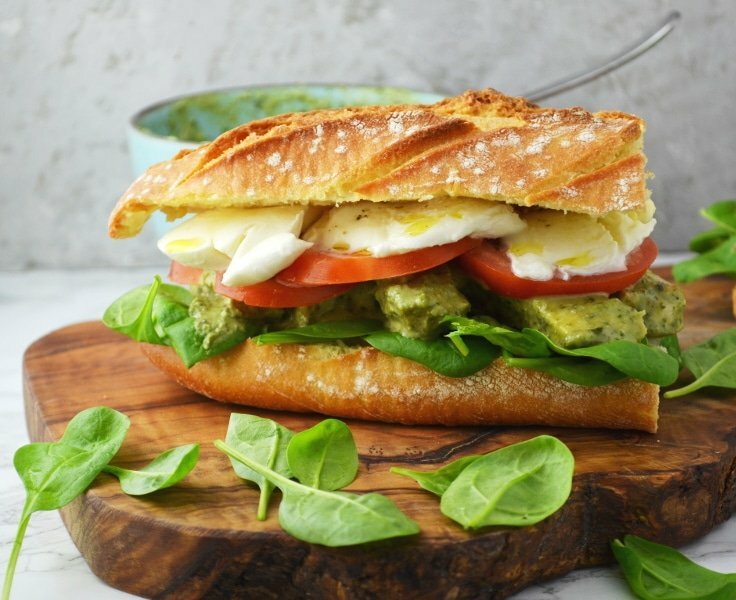 I am a huge pesto fan and sandwich fan! Ciabatta is the best! It definitely is a monster sandwich lol I love pesto too!! No problem John, thank you! Wow this looks great! We had some pesto in the house last week, but it’s all gone now. I think I need to make more to make this awesome looking sammie! Thanks Debi, homemade pesto never lasts long in the fridge! Such a glorious sandwich! Just what I want for dinner with a glass of wine! Aw thank you Lisa, it would be great with a glass of vino!